Jimmy Fallon loves to host mini game-show segments on The Tonight Show which entertain his audiences and reveal the playful natures of his guests. Sometimes he creates an original game like Word Sneak (A game in which guests are asked to weave random words into casual conversations), and sometimes he plays a traditional game like Catch Phrase (A timed game requiring guests to concoct clues to help team members guess familiar words and phrases.). 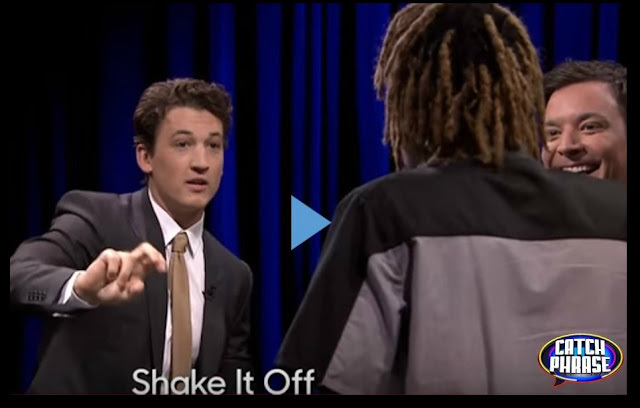 Watch Jimmy and his guests (Jim Parsons, Miles Teller and Wiz Khalifa) playing the Tonight Show version of Hasbro’s Catch Phrase. As I watched this segment, I couldn’t help thinking that this Catch Phrase format would be a perfect way to review idioms. All I had to do is grab a set of idiom cards and a timer (I used a round timer to make it look more like Jimmy's.) - and a display the rules. 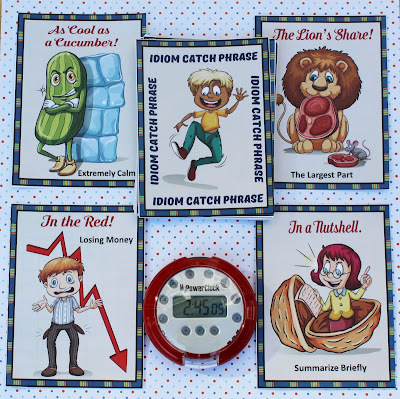 On the table, students will find a set of idiom cards and a timer. Each player takes turns trying to get his or her teammate to guess each idiom while holding onto a timer. When the idiom is guessed, the timer is passed to the next player. When the timer goes off, the opposing team is awarded 10 points for that round. After 3-5 one-minute rounds, the team with the most points wins the game. Being a fast talker, a good guesser, and a quick passer are all helpful skills that will help participants succeed at Catch Phrase! This is the last of the Jimmy Fallon Guide to Test Prep series. If you tried any of the featured review games, I'd love to hear about it. 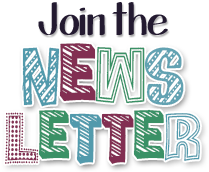 Would you like to receive our monthly newsletter? Click here. Follow Janice Malone - ELA Seminars's board Videos for Teachers on Pinterest. This sounds like so much fun! I bet there are other things you could practice with this game too, but I'd just have to think of them first, haha.